The median price of King County single-family homes sold fell 3 percent over the month to $485,000. The median price of King County single-family homes sold in July slipped 3 percent over the month to $485,000, a surprising reversal for a month that brought peak prices in each of the past two years. The drop comes after King County’s median home price hit a post-recession peak of $500,000 in June. July’s median price, reported Wednesday by the Northwest Multiple Listing Service, represented a 3.6 percent gain over the past 12 months, the weakest annual gain so far this year. The numbers suggest a cooling in an overheated market. From April through June, prices had jumped 9 percent to 12 percent from their year-earlier level, a pace far above the market’s historical average of about 4 percent. 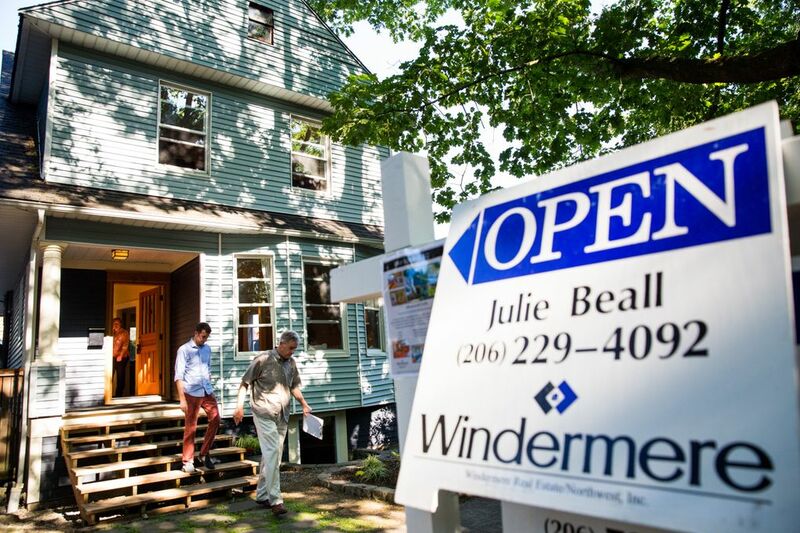 “The market is starting to normalize,” said Matthew Gardner, chief economist at Windermere Real Estate, the region’s largest residential real-estate brokerage. Lennox Scott, CEO of John L. Scott Real Estate, said the lower price in July also could be due to the mix of homes that sold. In Snohomish County, the median price of single-family homes sold was $362,987, up 8.4 percent over the year. In Pierce County, the median was $247,000, 5.2 percent higher than a year ago. And in Kitsap, it was $280,000, up 9.8 percent. While the number of home and condo sales in King County was up 15 percent over the year, the increases in Snohomish, Pierce and Kitsap counties all topped 20 percent. More than half of Seattle Times readers who responded to a poll last month said “the single biggest reason” keeping them from buying a home was affordability. Another one-fifth said they couldn’t find a home they want to buy. Though King County’s supply of homes listed for sale is extremely tight, July was the third month in a row the supply increased. King County had just over a month’s supply in July, according to a Seattle Times analysis of MLS data. 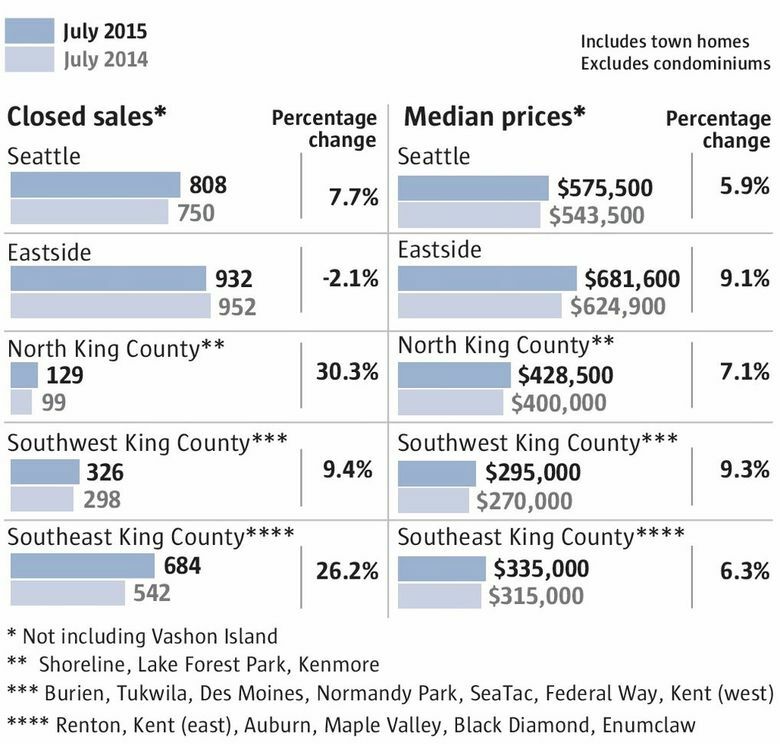 Most of the homes sold in King County were on the Eastside and in Seattle. The Eastside’s median price was $681,600, 9 percent higher than a year ago. In Seattle, where the number of active listings was down more than 40 percent compared with a year ago — the steepest decline among the area’s submarkets — the median price was $575,500, 6 percent higher than a year ago. The submarkets in the two counties with the lowest median prices were Northwest Snohomish County, at $281,000, and Southwest King County, at $295,000, according to MLS data. Those were 4.7 percent and 9.3 percent higher, respectively, than a year ago. The condominium market saw a frenzy of activity compared with the single-family market: Sales in King County were 40 percent higher over the year, while only 9 percent more single-family homes sold than a year ago. The median King County condo price rose 19 percent to $297,500. Downtown Seattle, the region’s largest condo submarket, saw a 150 percent jump in sales and a 28 percent jump in the median price to $516,550. Through July, the median price in most submarkets in King County is now at or above their last peak during the housing bubble, according to a Seattle Times analysis of MLS data. 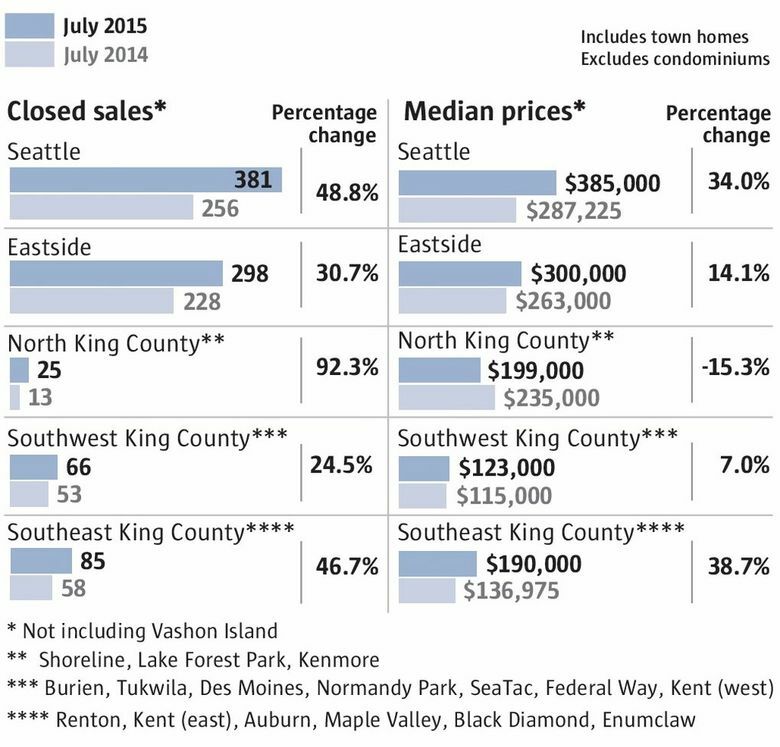 South King County is the only major submarket where that’s not true. Sellers in King, Snohomish and Pierce counties who sold their homes in the first six months of this year reaped, on average, a 20 percent gross profit, according to RealtyTrac, an Irvine, Calif.-based data provider. That was one of the highest gains among the nation’s metro areas, far above the 13 percent average gain nationally, RealtyTrac said. Daren Blomquist, RealtyTrac’s vice president, said one sign the Seattle metro market is returning to health is that first-time homebuyers are increasing their share of home sales, after years of losing out to institutional investors, foreign investors and all-cash buyers. RealtyTrac reports that about 18 percent of all single-family and condo sales in the second quarter were financed with loans backed by the Federal Housing Administration (FHA), which offer low down payments but require documentation of income. That’s up from 13 percent of sales a year ago, RealtyTrac said.